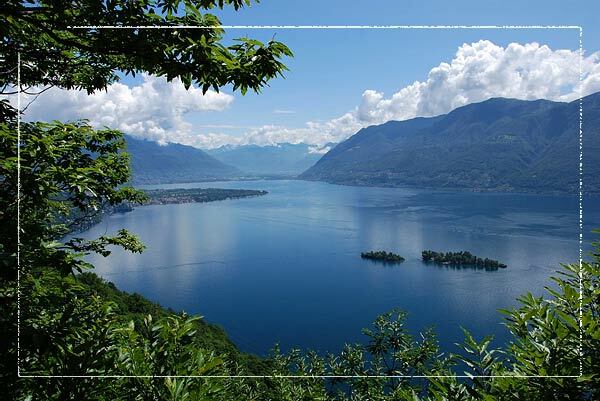 Lake Maggiore is located mostly in Italian territory but very North side is in Switzerland. 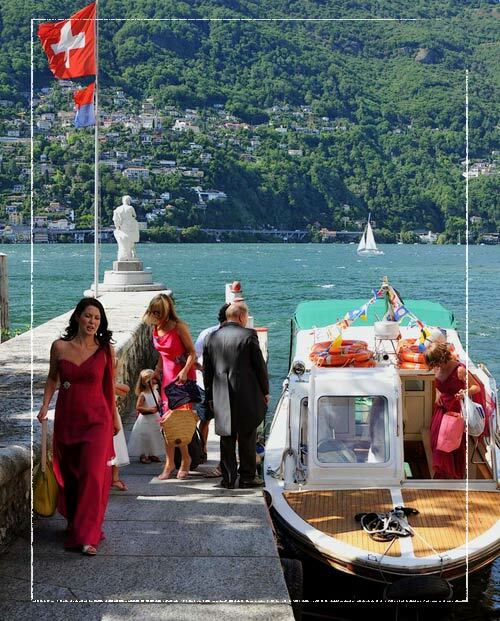 This is a well known area with many touristy destinations such as Brissago, Locarno and Ascona that have a peculiar Italian character and surely a mild climate. It is for this reason that we want to go out for Italy for a moment, just few kilometers to reach Italian Switzerland. 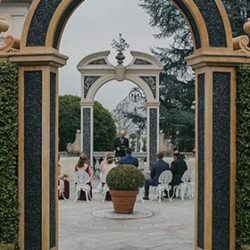 You may remember we mentioned this area one year ago in occasion of Natascia and Paolo’s country wedding to Bellinzona Castles. 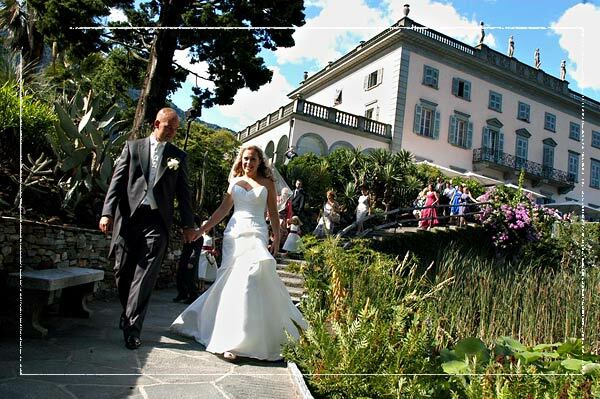 Today we would love to speak about Fiona and Scott’s wedding on Brissago Islands. You already know Fiona and Scott. 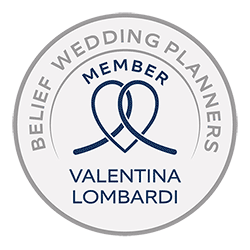 We introduced them at the end of July in our Just Married section with some photo preview of their wedding. Bride and gromm wanted Studio Artefoto Omegna by Raffaello Mazzoleni as their photographer helped by skilled photographer Moreno Nicoloso. 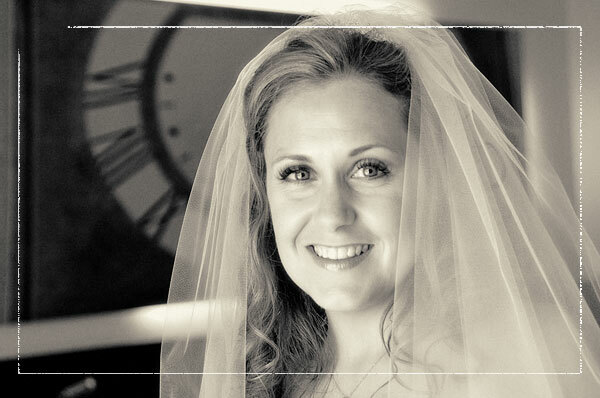 Today we are showing you the best images of Fiona and Scott’s wedding. 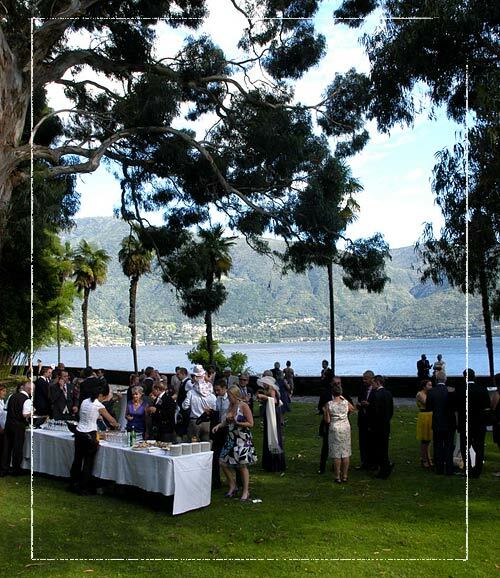 Do not miss the PHOTO GALLERY with many other shots of this fantastic event on Lake Maggiore. Now let Fiona introduce herself! 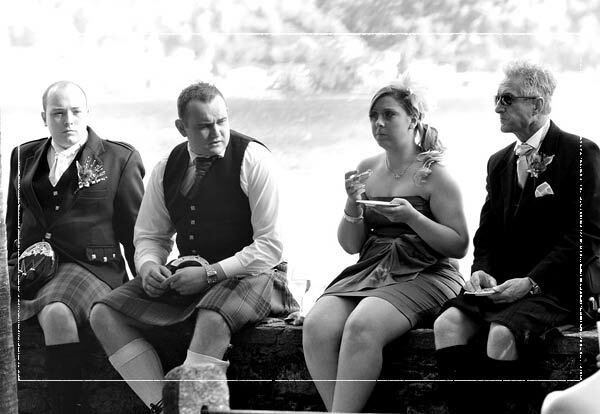 My family are from Scotland although I grew up in London, and Scott’s family are from England. We lived very close by to each other, and even went to the same school, but didn’t meet until 6 years ago! 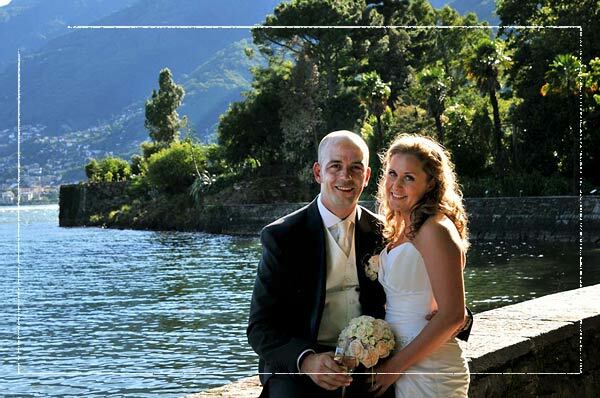 Fiona and Scott’s wedding took place on Isole di Brissago entirely. It is a group of Islands located just 5 minutes cruise from Porto Ronco. There is the little Island of St. Apollinare (closed to public but kept as natural park) and Isola Grande (or St. Pancrazio) that at the beginning of 1900 has been transformed in a wide botanic park by German trader Max Emdem. The view here is grand: a 2.5 hectares park with more than 1500 species of plant coming from all over the world! We chose Isole di Brissago because we come to Ticino often as my parents have a house in Locarno. We can see the Islands from the house, and knew it would mean we could see the place of our special day each time we visit. We felt very relaxed during our visits to the Island and this was very important to us. 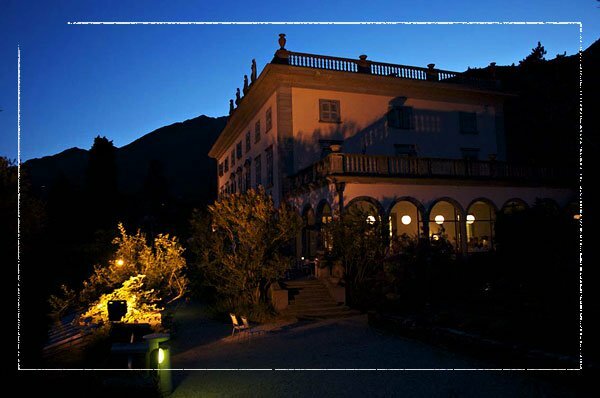 On Isola Grande there is grand Villa Emden. This is a luxury palace built in Neoclassic style. It was built in 1927 with 30 rooms, a winter garden (organgerie), Roman bath (33 metres long) and a pier, all still existing. Today Villa Emden host an exclusive restaurant and an exhibition, cultural and entertainment area which can host different kind of events. Fiona and Scott’s big day begun early in the morning. 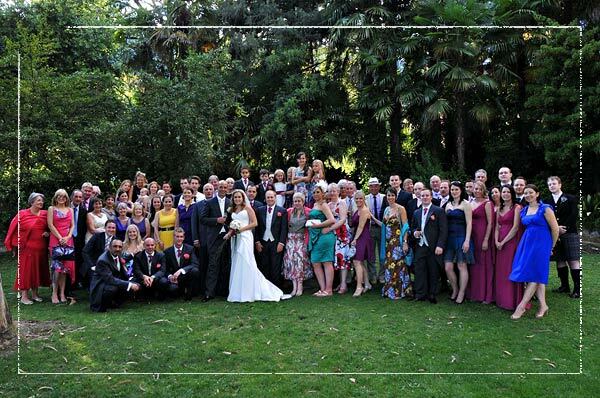 Bride and groom and all guest were to Hotel La Meridiana in Ascona. They all took a lovely motorboat to reach Brissago Islands. 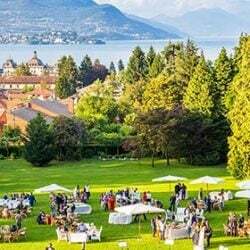 All event took place to Villa Emdem: from the civil ceremony, the aperitif in the garden and the dinner in the wide golden room with huge windows with lake view. The Islands are so beautiful and we could have the whole Island to ourselves from 6 O’Clock in the evening. We had a choice of areas in which to have our drinks reception, so chose to have two, one before the ceremony and one afterwards. All of the staff on the Island, both from the office and the restaurant, were very helpful and friendly, which was important to us. Charlotte from the restaurant, Mascia and Brigitte from the office on the Islands were amazing, and helped very much with the planning. Brigitte gave our guests a talk about the history of the island during our welcome drinks reception which we had in the Roman Garden. We couldnt’ have managed our day without Charlotte – she was on hand all day to help us, and was very organised and good fun throughout. Our friends and family also played a huge part in helping us to organise getting everything to the Island and back again. 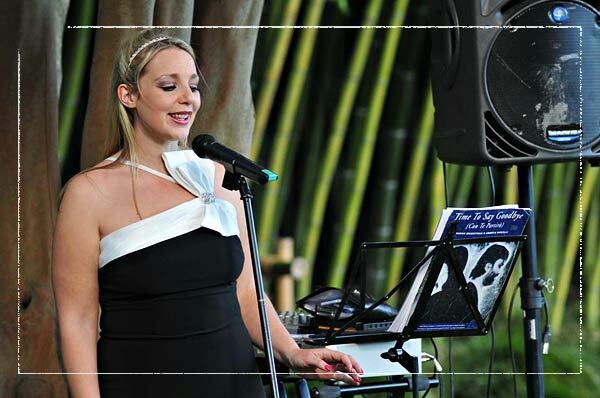 Musical entertainment, from ceremony to dinner was arranged by wonderful voice of English singer Gemma Turner. 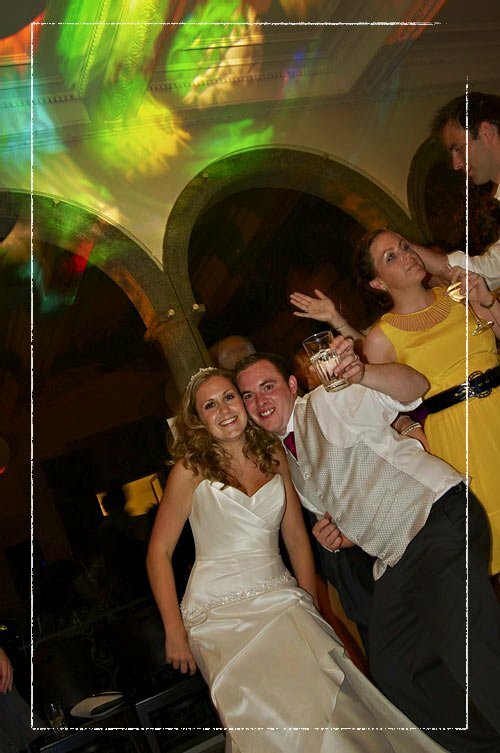 Our singer was called Gemma Turner, she’s from England but was happy to travel to Switzerland for the wedding and said she’d love to go back and visit again. She is a classically trained singer, and gave us lots of suggestions for songs she could sing, her repertoire was mainly classical but with some ballads which we knew were much loved by our family. For my entrance to the ceremony she sang O mio babbino caro. Our family and friends were very complimentary about Gemma, and she helped to make our day and our guests day very special. She has a beautiful voice, and was lovely to deal with all the way through. You can hear her singing through her website www.gemmaturner.co.uk. I hope you enjoy her voice! 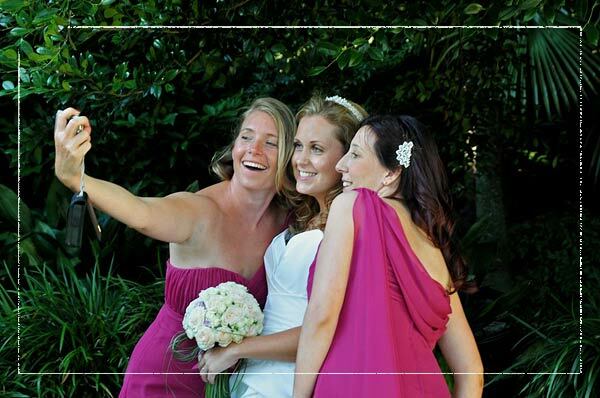 Floral arrangements were very special starting from Fiona’s bouquet! It was made with different dimension of several shades of pastel roses together with a fall of Bear Grass. Our florist, Fiori di Flora from Locarno, was very creative and made some beautiful flowers for my bridesmaids, myself and also our decorations. She was very friendly and helpful, even though we only decided on the flowers 5 days before the wedding. 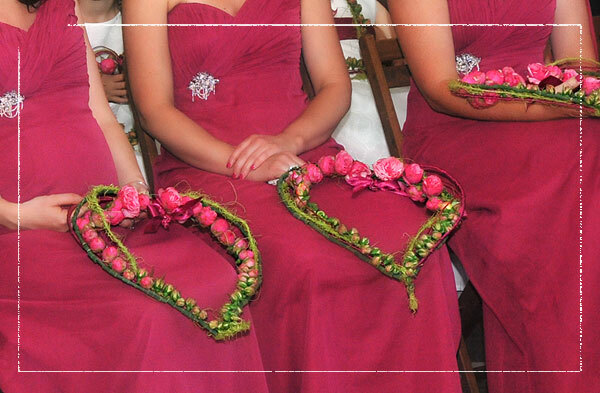 Have a look to bridesmaids’ bouquets made with little fuchsia roses in a heart shape. 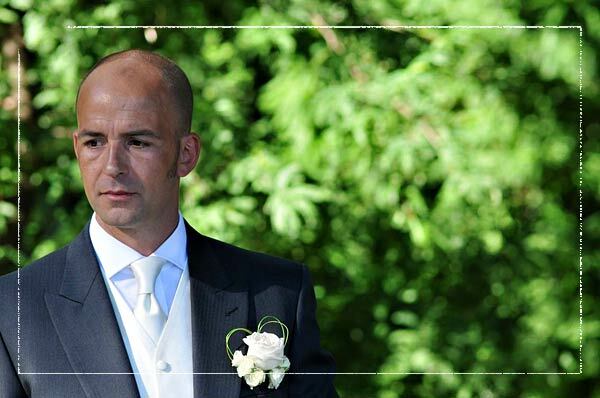 Last but not least a special note for the photographer of the event, Moreno Nicoloso from Raffarello Mazzoleni – Studio Artefoto Omegna’s team. Moreno, was brilliant during the day. He spent a lot of time to look for the right light for some of our pictures, but also was very unobtrusive in taking the pictures. 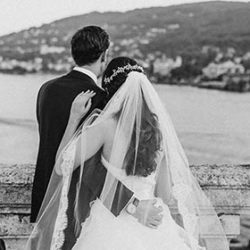 We’ve seen three of the pictures already (on Italian lakes Wedding’s post Just Married on Brissago Islands) and love each of them. He was a very lovely man, and all of our guests liked him too! Fiona and Scott’s wedding went on until late at night: dances, music and lot of fun! We were very lucky that the weekend of our wedding there was a fireworks festival, so after our meal we went outside to watch these before starting our party. 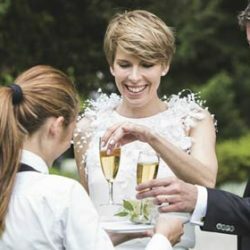 After our wedding, Scott & I stayed at Garni La Meridiana in Ascona and drank some vintage champagne on our terrace, which one of our guests had given us as a gift, whilst opening some cards from our friends and family. 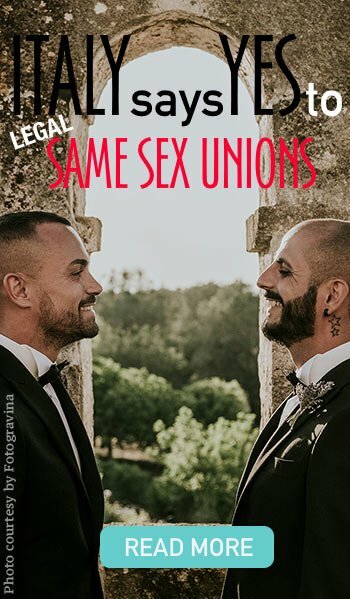 This made the perfect end to a very beautiful and special day. My parents also hosted a drinks evening at our house the night before the wedding, which many of our guests came to, and we spent lots of time with our guests the night after the wedding too. 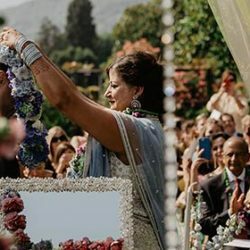 My dad helped by taking friends and family to airports and train stations to make their journeys much easier, and spending all of this time with people meant that we got a whole weekend to enjoy our wedding rather than one day! 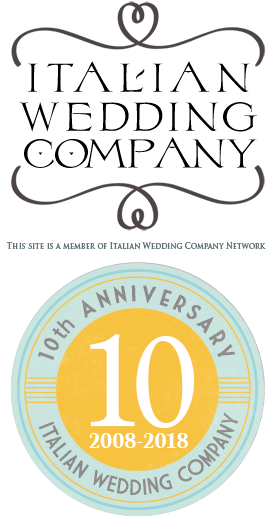 Visiting Ticino in the future will now be extra special for us both. 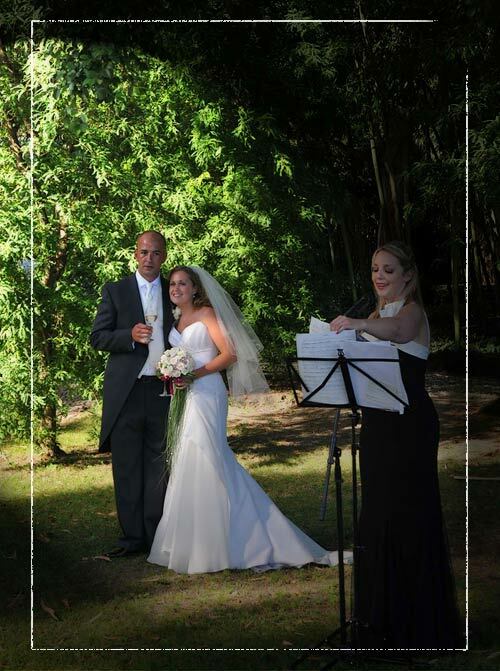 Our best wishes to Fiona and Scott for a lot of happiness from all Italian Lakes Wedding Team. All images © Raffaello Mazzoleni’s photographers team. 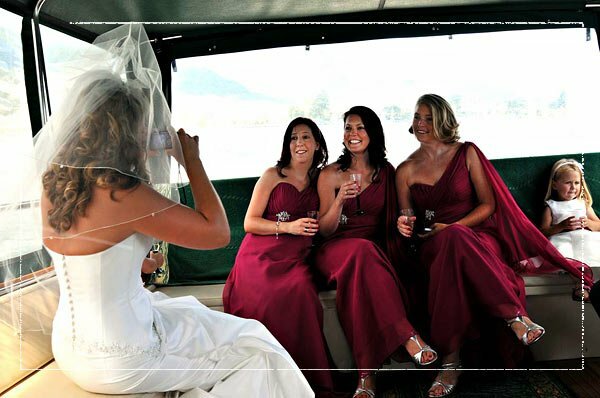 For more information about weddings on Brissago Islands, Ticino – Lake Maggiore – please CONTACT the Italian Lakes Wedding team.